Far Eastern Economic Review, Feb 10, 1994. Adding to the irony are the new contortions Hanoi must go through in advancing its claims to the Paracels. Because of its past acquiescence, Hanoi is forced to refer not to its own public statements from the 1950s to the 1970s but to Saigon statements - in effect, legitimising the South Vietnamese government. For as early as 1956 the Saigon government issued a communique reaffirming its ownership of the Paracels and the Spratlys. With the advantage of two decades of history, it should now be possible to assess the acts of the South Vietnamese administration with a more dispassionate eye. In the interests of healing the wounds of war if nothing else, it may be wise for Hanoi to re-examine the record and accord credit where credit may be due. And the Saigon administration's vigorous defence of Vietnam's claims to the Paracels at a time when Hanoi was busy courting China's favour stands out as an act that should be acknowledged. 2) Background on the claims of the said islands. Vietnam claimed sovereignty over the "Hoang Sa and Truong Sa Archipelagoes" basing on old documents and especially, Ly Qui Don's "Phu Bien Tap Luc". Vietnam called them Hoang Sa (Paracels) and Truong Sa (Spratlys); China called them Tay Sa (the Xisha) and Nam Sa (Nansha) islands. Vietnamese clashed with the People's Republic of China on 19/1/1974 whereby a former South Vietnam Navy's big boat was sunk and 40 Viet men were captured. In 3/1988, PRC came and sunk 3 Viet boats; 72 men were killed and 9 captured. On 25/2/1992, PRC declared Truong Sa or Spratly Isands were theirs. The main reason for China to do this was known before as part of the plan called "Survival Space" because resources of the two areas, Manchuria and Tian Shan, would be depleted soon. To do this, China started with the easiest part - what Viet communists did promise before. It means China based on a secret deal in the past. In Reuter's news of 30/12/93, Viet commies denied this secret deal but didn't give any explanation why not. Le Duc Anh visited China and got delay of the conflict for 50 years. Did China stand Anh's ungratitudeand past promise ? 3) Vietnamese communists sell the Paracel and Spratly islands, but now want to say no. - In June 1956, two years after Ho Chi Minh's government was re-established in Hanoi, North Vietnamese Vice Foreign Minister Ung Van Khien said to Li Zhimin, Charge d'Affaires of the Chinese Embassy in North Vietnam, that "according to Vietnamese data, the Xisha and Nansha islands are historically part of Chinese territory." - On September 4, 1958, the Chinese Government proclaimed the breadth of its territorial sea to be twelve nautical miles which applied to to all territories of the PRC, "including ... the Dongsha Islands, the Xisha Islands, the Zhongsha Islands, the Nansha Islands...". 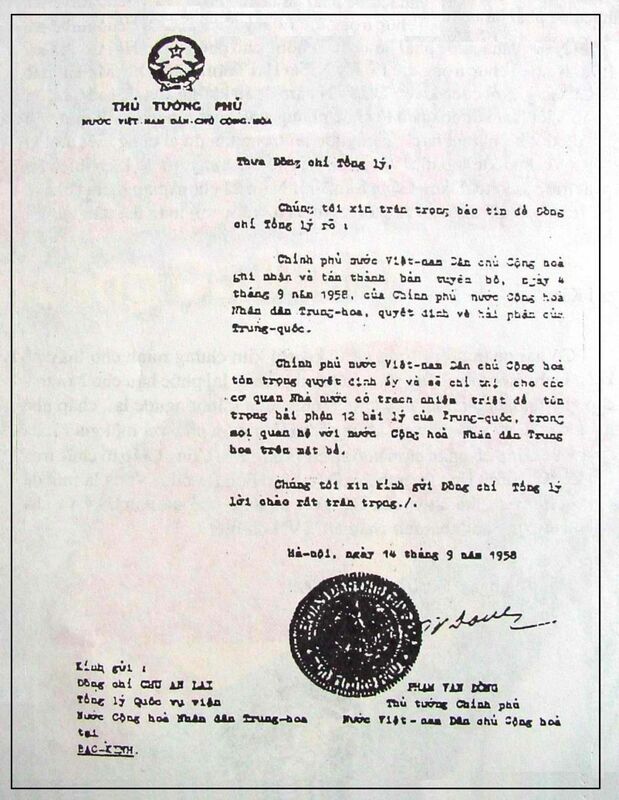 Ten days later, Pham Van Dong stated in his note to Zhou Enlai that "the Government of the Democratic Republic of Vietnam recognizes and supports the declaration of the Government of the People's Republic of China on China's territorial sea made on September 4, 1958." One more thing to notice is that PRC threatened only the territories Vietnamese claimed and left open claims of other countries. It was very clear that Mr Ho Chi Minh, through Pham Van Dong, gave PRC "a big pie" because at that time Mr Ho Chi Minh was preparing for invading South Vietnam. Mr Ho needed colossal aids and closed eyes to accept all conditions of Beijing. It was easy for him to sell "only on paper" two archipelagoes which still belonged to South Vietnam by then. For this, Vietnamese communists waited for a meeting of ASEAN countries in Manila, used this opportunity as a safe buoy and signed right away a paper requiring these countries to hepl Vietnam to solve this problem "fairly". Because of eagerness to create disastrous war for both areas North and South, and to contribute to international communism, Mr Ho Chi Minh did promise, without dignity, a "future" land for Chinese to grab, not knowing for sure that whether or not the South Vietnam would be swallowed. As Dong said, "That was the war period and I had to say that". Who created the Vietnam War and ready to do all it could to get South Vietnam even to sell land ? Selling land during the war time and when it was over Pham Van Dong Dong denied it by just laying falsely the blame on the war. 4) In "The Sino-Vietnamese Territorial Dispute" by Pao-min Chang in The Washington Papers/118, foreword by Douglas Pike, published with The Center for Strategic and International Studies, Georgetown University, Washington D.C.
Apart from the geographical distance, both island groups lay off the South Vietnamese coast still under jurisdiction of the hostile Saigon regime. Hanoi was simply in no position to challenge both Chinese claims and US Sea power at the same time. Thus, on June 15, 1956, Premier Pham Van Dong reportedly said to China :"From the historical point of view, these islands are Chinese territory" (Beijing Review March 30, 1979, p.20 -- Also in Far East Economic Review Marcg 16, 1979, p. 11). In 9/1958, when China, in its declaration extending the breadth of Chinese territorial waters to 12 nautical miles, specified that the decision applied to all Chinese territories, including the Paracels and the Spratlies, Hanoi again went on record to recognize China'sovereignty over the 2 archipelagoes. Pham Van Dong stated in a note to Chinese leader Zhou Enlai on 14/9/1958 :"The Government of the Democratic Republic of VN recognizes and supports the declaration of the Government of the People's Republic of China on its decision concerning China territorial sea made on 4/9/1958” (see Beijing Review 19/6/1958, p.21 -- Beijing Review 25/8/1979, p.25 -- The existence of such a statement anf its contents were acknowledged in VN in BBC/FE, no. 6189, 9/8/1979, p. 1). In pursuing its national interests, Vietnam has undertaken actions which appear highly provocative from China's point of view. For example, during Vietnam's long struggle for independence it made no public protests over Chinese claims to territory in the South China Sea and indeed supported them. Yet after unification Vietnam reversed its stance. In 1975 Vietnam occupied a number of islands in the Spratly archipelago and subsequently pressed territorial claims to the entire South China Sea. "Our leaders' previous declaration on the Hoang Sa (Paracel) and Truong Sa (Spratly) archipelagoes was made in the following context: At that time, under the 1954 Geneva agreement on Indochina, the territories from the 17th parallel southward including the two archipelagoes were under the control of the South Vietnam administration. Moreover, Vietnam then had to concentrate all its force on the highest goal of resisting the US aggressive war to defend national independence. It had to gain support of friends all over the world. Meanwhile, Sino-Vietnamese relations were very close and the two countries trusted each other. China was according to Vietnam a very great support and valuable assistance. In that context and stemming from the above-said urgent requirement, our leaders' declaration [supporting China's claims to sovereignty over the Paracel and Spratly islands] was necessary because it directly served the fight for the defence of national independence and the freedom of the motherland. More specifically, it aimed at meeting the then immediate need to prevent the US imperialists from using these islands to attack us. It has nothing to do with the historical and legal foundations of Vietnam's sovereignty over the,Truong Sa and Hoang Sa archipelagoes (remarks to a press conference in Hanoi on 2 December 1992 carried by Vietnam News Agency, 3 December 1992)." These statements show that all what Chinese have alledged above are true. What happen today related to these 2 islands are merely consequences of the wicked settlement of these 2 communist brothers in the past. No one in the world community want to step in to settle the dispute between Communist Vietnam and PRC. The reason is very clear : diplomatic note and recognition by Vietnamese Communists can't be erased by a small country like Vietnam who has wanted to play a trick cheating China. Moreover, Vietnamese Communists can't stay away from China while they have to follow Chinese "doi moi" to go forward to socialism.